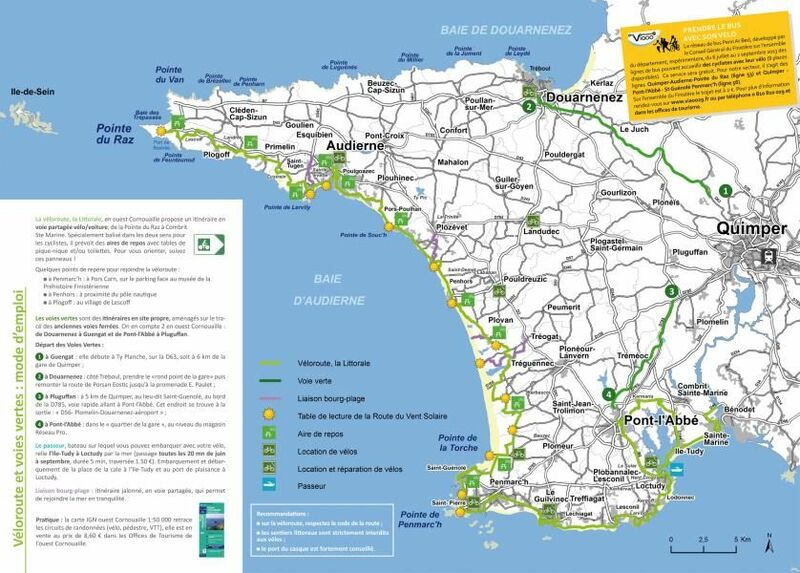 From the Pointe de la Torche, alongside Audierne Bay, up to the Pointe du Raz and Douarnenez Bay, there are nearly 400km of signposted bicycle tracks along the paths and minor roads in West Cornouaille. Quimper is the capital of Cornouaille and lies at the crossroads of two Greenways, one which goes to Douarnenez Bay and the other to Pont-L'Abbé. The Douarnenez > Quimper Greenway provides 16 km of recently renovated track, and connections take you back to Douarnenez and Quimper town centres for an overall circuit of 26 km from Tréboul train station to Quimper. During a ride on the Goyen Valley Circuit (marked as No.8), its treasures will be revealed to you (chapels, manor houses, fountains, roadside crosses, meadows, etc.) all along its 29 km. Accessible to everyone (in spite of a few more technical parts when crossing the valleys).